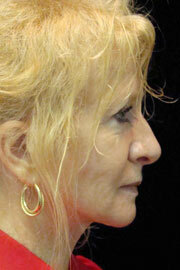 In recent years there has been a very strong trend toward less invasive facial rejuvenation. 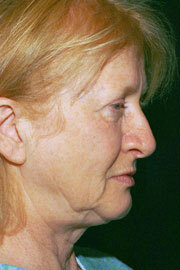 Patients want a cosmetic improvement but do not want to suffer prolonged recovery or a high risk of complication. Because of this, purse-string, suspension-based facelifts have gained great popularity. 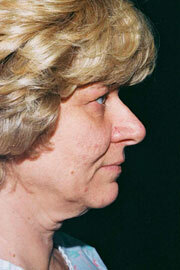 However, many surgeons have voiced skepticism over the long-term effectiveness of these procedures. The three primary lifts that have been published in peer-reviewed journals are the S-lift (see figure 1), the MACS lift (see figure 2), and the QuickLift (see figure 3). 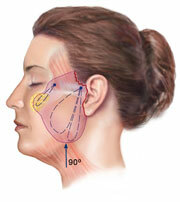 All three techniques use the concept of suspending sagging facial features with strong, permanent purse-string sutures. Fig. 1: S-lift. This schematic demonstrates the undermining, O- and U-shaped purse-strings, incision (in red) and vector of advancement. Fig. 2: MACS lift. This schematic demonstrates theundermining, O- and U-shaped purse-strings, malar fat pad purse-string, incision (in red) and vector of advancement. Purse-string sutures are firmly anchored at either the zygomatic arch (S-lift and QuickLift) or at the temporalis fascia (MACS lift). The S-lift and the MACS lift use an O-shaped and a U-shaped purse-string. The MACS lift in some cases uses a third suspension purse-string to elevate the malar fat pad. The QuickLift features a central, oval-shaped purse-string surrounded by an extremely large encircling purse-string. When purse-string suspension sutures are tightened, the SMAS is compressed, forming multiple gyri which then fibrose and give longevity to the procedure. In addition, as the purse-string is tightened, there is a pulley-type effect that strengthens the suspension with each additional throw of the suture and significantly reduces the chances of SMAS tear-through. In the first 22 years of my career, I performed traditional superficial and deeper plane facelifts with results that I felt were good, but with complication and morbidity rates that were sometimes not acceptable. In 1999, I heard Dr. Ziya Saylan present a lecture on the S-lift and started performing this technique on a select few patients with moderate, but encouraging results. I found that this technique worked well on patients in their forties, but for women who were post-menopausal (age 50 plus) the technique lacked the long-lasting improvement in the jowl and neck region that I and my patients sought. I felt that the 30 to 45 degree backward vector of the purse-string, insufficient undermining, and inferior platysmal tightening caused this result. In 2003, I began changing the shape of the incision, increasing the degree of inferior-posterior suspension and the method of tightening (double concentric purse-strings) to create a more vertical 60 to75 degree advancement that I hoped would treat patients in their fifties, sixties and seventies more effectively. Fig. 3: QuickLift. This schematic demonstrates doubleconcentric overlapping purse-strings, incision (in red) and vector of advancements. In 2004, I published results from my first version of the QuickLift in the journal Cosmetic Dermatology. 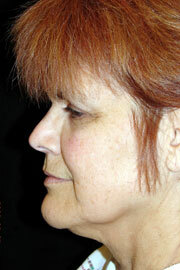 Since then I have modified the technique by increasing the length of the posterior incision and increasing the anterior undermining on certain patients who have heavier jowls, excessive submental redundancy and a sunken mid-face, which is often more present with older patients. These changes create a more effective lift of the lower and mid-face regions, giving the surgeon more variety to treat these select patients more completely. Additionally, in a certain percentage of patients, I have modified the procedure with a posterior cervicoplasty and/or more anterior-inferior undermining. 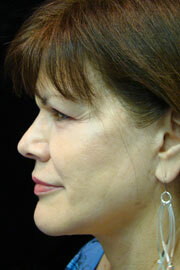 The QuickLift, like any other cosmetic procedure, is not a cookie-cutter solution. It must be applied differently to address each patient’s unique situation. Patient outcomes, as with every facelift procedure, will vary due to all of the physical characteristics mentioned, and those specific to the patient’s healing and intrinsic skin qualities. Over the last six years, I have performed more than 1,800 QuickLift procedures. It has been my observation that the procedure produces consistent, long-term results (see figures 4a-b, 5a-b, 6a-b). I have also found that after the initial six to twelve month postoperative period, when virtually all of the expected skin relaxation has occurred, any further appearance changes are actually due to the normal aging process and not procedure shortcomings. Fig. 4a-b: 64-year-old white female three years post-op from QuickLift, volume of brow and lips, and Hetter’s peel to the eyelids. Fig. 5a-b: 67-year-old white female five years post-op from QuickLift and upper lid blepharoplasty. Fig. 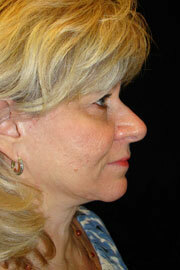 6a-b: 55-year-old white female five years and 10 months post-op from QuickLift and Hetter’s peel to the eyelids. Over the years, I have tried to focus more on the perspective of my patients and less on my own. I now more clearly understand not only their physical appearance objectives, but also their concerns of risk, down time and cost; as well as their overall interest in an easier, less complicated experience. These desires have led me and other surgeons to develop procedures that are less invasive. There has been skepticism expressed by some surgeons toward less invasive facelifts, which creates healthy dialogue, as long as it is based on fact and personal experience, not merely opinion. However, I believe the QuickLift and many purse-string mini-lifts are proving to deliver very good long-term results when the appropriate approach is used for the patient. In general, my experience is that the S-lift works well on patients in their forties, that simplified MACS lifts and QuickLifts work well for patients in their fifties, that advanced QuickLifts (more anterior undermining and suspension) and MACS lifts (posterior cervicoplasty and malar suspension) work well for patients in their sixties, seventies and even eighties.